Doping, which is the intentional introduction of impurities into a material, can improve the metal-semiconductor interface by reducing Schottky barrier width. Here, we present high-quality two-dimensional SnS2 nanosheets with well-controlled Sb doping concentration via direct vapor growth approach and following micromechanical cleavage process. X-ray photoelectron spectroscopy (XPS) measurement demonstrates that Sb contents of the doped samples are approximately 0.22%, 0.34% and 1.21%, respectively, and doping induces the upward shift of the Fermi level with respect to the pristine SnS2. Transmission electron microscopy (TEM) characterization exhibits that Sb-doped SnS2 nanosheets have a high-quality hexagonal symmetry structure and Sb element is uniformly distributed in the nanosheets. The phototransistors based on the Sb-doped SnS2 monolayers show n-type behavior with high mobility which is one order of magnitude higher than that of pristine SnS2 phototransistors. The photoresponsivity and external quantum efficiency (EQE) of Sb-SnS2 monolayers phototransistors are approximately three orders of magnitude higher than that of pristine SnS2 phototransistor. 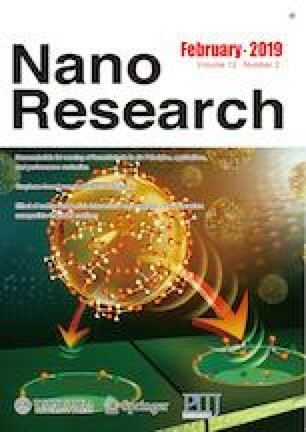 The results suggest that the method of reducing Shottky barrier width to achieve high mobility and photoresponsivity is effective, and Sb-doped SnS2 monolayer has significant potential in future nanoelectronic and optoelectronic applications. We acknowledge support from the National Natural Science Foundation of China (Nos. 61804050, 51872086, 61622406, 11674310, and 61571415), the Double First-Class Initiative of Hunan University (No. 531109100004), and the Fundamental Research Funds of the Central Universities (Nos. 531107051078 and 531107051055).